Maia seems to be coming on leaps and bounds, or as leapy and boundy as a game that's been in Early Access for around a year can be. It's not quite cooked enough for me to take a bite yet, but I do like checking in on it now and again. If you're the same as me (or if you've actually bought the thing), you'll be pleased to hear that another biggish update has just been applied, adding a 3D printer for 3D printing little robots, a botany station for researching plants, bodybags (for there not being rotten bodies everywhere), and various bug fixes and tweaks. 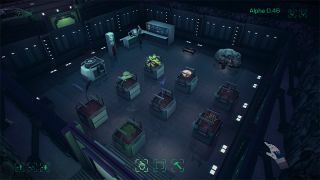 The most sizeable addition appears to be the aforementioned botany stuff, which will let you send your little people and robots out into the wild to harvest plants. Plants can be researched to unlock new technologies—technologies such as the 'Caesar Salad'. Probably. Look, I'm no biologist, but I do know food. There aren't nearly enough ugly molerat creatures in this latest update, but it sounds like there's going to be an even more monstrous addition to the game next time. Developer Simon Roth says that we can "expect colonists to show their emotions, write useful base reports and even look forward to a new terrifying creature to sabotage your base" in update 0.47. Great, thanks a lot Simon, cheers for that.